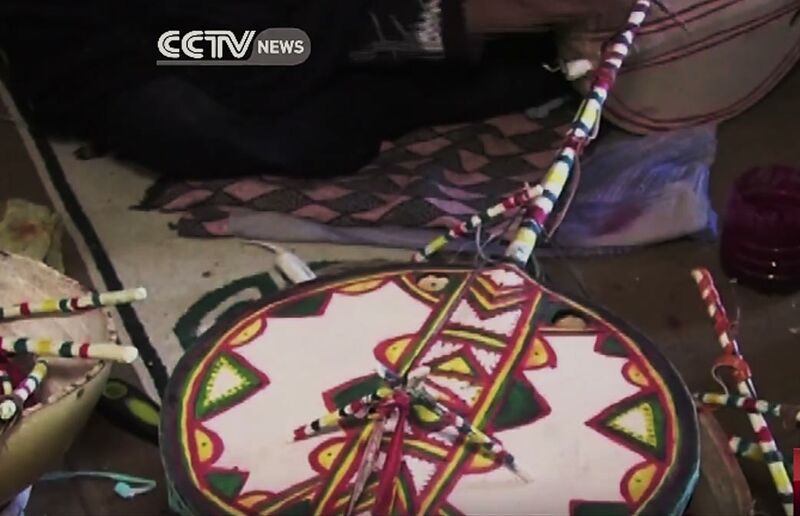 A traditional stringed gourd instrument of the Tuareg people in Africa, played only by women because of the threat of a curse upon men who play it, is making a comeback. Only two women were known to have been playing the imzad in recent years. But the ancestral instrument is making a resurgence and is now being taught in two schools. Years ago musician Khoulene Alamine set out to resurrect the single-string violin called an imzad, which is made from calabashes and animal skins. She is now in her 80s and has played refined laments to heroes on the instrument since she was 10. The imzad was also played during long, overnight courtship rituals that are no longer practiced by the Tuareg. “Young people are only interested in the television and telephone these days. When I was younger, I lived in the desert and took the time to learn to play and enjoy the instrument,” Ms. Alamine said in a CCTV report on YouTube. Women in the matriarchal Tuareg communities in the Tassili and Haggar mountains of southern Algeria and nearby desert areas of Mali and Niger have played the instrument for generations. Other reasons they played the imzad were to chase away evil spirits and heal the sick. Men and women chant and sing along with the imzad players during performances. But the tradition was near extinct when Husseini Nekhat, Sedik Khetalli, and Farida Sellal launched the Save the Imzad Association in 2003. Since then, the instrument has been included on the UNESCO Cultural Heritage list. The association has a recording studio, dance studio, performance stage, and a workshop for making the instruments. It also has a garden in which calabashes are grown to make the imzads. UNESCO has a short article about the imzad with photos here. Farida Sellal, an engineer born in Algiers, saw the traditional music played when she was a postal and telecommunications official in Tamanrasset in the 1970s. Tamanrasset is on the Tagmart plateau, where Ms. Alamine lives. Ms. Sellal’s love for the desert brought her back there about 30 years later. AhramOnline says it takes up to several days to make the instrument. The crafter stretches a gazelle or goatskin over half of a dried calabash shell and pierces the sound box with two holes. She then adds personalized decorations based on Tuareg motifs. The handle is made of oleander or acacia wood. Music producer Mehdi Bennacer said that with interest in the Tuareg music around the world, popularized in part by the desert blues group Tinariwen, he hopes the imzad will survive. There is another traditional group called Imzad, whose music is on YouTube.